The best gifts are ones that actually come in handy. 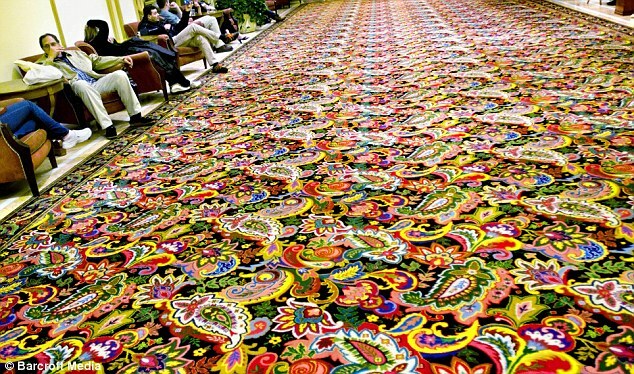 Useless gifts collect dust in the corner of the room until your next trip to the Salvation Army. Useless gifts mainly come from wedding receptions: Mini bamboo trees, decorative paper weights, a bottle of bubbles… I’m sure they seemed like a great ideas in the beginning, but then again so does posing with a parasol on a Greek pillar. Whenever that day of holy matrimony arrives, why not give your guests a cheesy party favor they can put to good use: a his and her USB flash drive. Each stick holds up to 2GB worth of music, photos, or whatever you like carrying in your back pocket. 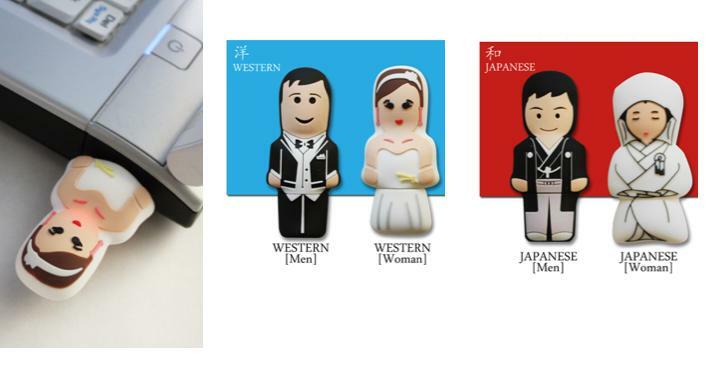 They come either Japanese or Western-clothed, and with its rubbery shell you can bounce your bride/groom off walls – just like in a real marriage! Buddhist statues are somewhat of an obsession for artist Kenji Notani. In particular, it was the eleven-headed bodhisattva (Juichimen-Kannon) that caught his eye at a temple one day in Nara City. He took out a sketch book, began drawing — and hasn’t stopped since. This particular bodhisattva is the Goddess of Mercy whose job is to save each one of us from suffering and anguish. Human suffering was so immense that she split her head into 11 parts to absorb it all. Japanizmo is proud to feature Notani’s work in our RiseUp Japan collection because it is our sincere wish that the Goddess of Mercy would extend her good graces on the people of Northern Japan. This heavy-weight, high-quality cotton T-shirt comes in a choice of 16 different colors ($25.99). It’s also available in organic tees ($28.99) and form-fitting tees especially for women ($27.99). A gifted animation artist, Notani has worked at Sanrio Co. and Nickelodeon Animation Studios during his long career, undoubtedly drawing an array of cutesy images. But it’s the image of Buddhist gods — in its serenity and solemn splendor — that has truly captured his heart. Notani hopes the gods will capture your heart as well. There’s no end to my obsession with all things sweet. I dream about swimming in a pool of melted chocolate and opening a closet stacked with strawberry sponge cake. I want to wear a sundress made of crepe and Nutella! 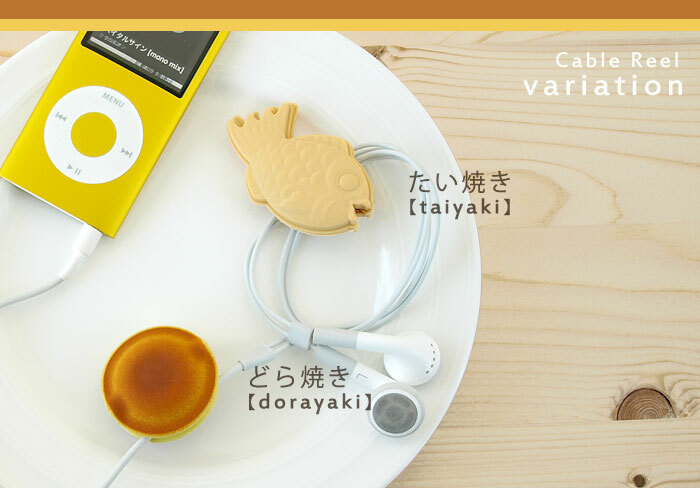 That’s right, it’s an iPod cord clamped with a fish and a pancake. They’re actually two of my favorite Japanese sweets called Dorayaki and Taiyaki — hot, iron-grilled cakes filled with sweet red-bean paste. You’ll find all kinds of variations throughout Japan, stuffed with custard, strawberries and cream, or mixed with green tea powder. Though it’s a novel creation to fill them with a bundle of wires. The accessories don’t just hang pretty; they serve as a spool, helping you wind up annoyingly long cords dangling from your ears. They’re soft and springy so they almost feel like the real thing, only without the sweet filling. When I get them ($5), I need to remind myself not to get in the habit of gnawing on them. It’ll end up being a real shocker if I do! The way it works is that you roll the die to see what words pop up. One says either “I am sorry” or “You are sorry.” Another says, “I clean,” “You clean” or “Together.” It’s a brilliant invention made for conflicting opinions that really don’t stand to be settled in an hour-long battle of the sexes. There’s also “I pay,” “You pay,” and “Dutch” when you’re tired of playing a game of “get the bill.” Personally, I’m not one to argue — If you really want to pay the bill, be my guest. And then there’s “I wash,” “You wash” and “Together,” in which all sorts of fun can ensue…washing the dog. Couples can rejoice in letting petty arguments be settled by an unbiased arbitrator, and at a fraction of the cost of a good divorce lawyer. The only thing that’s missing with this dice is a magnetic device that can roll the words to my favor. That way you’ll get a free dinner every time! 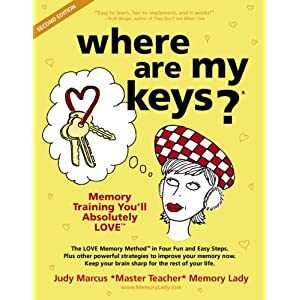 Have you ever come home after a long day, throw your keys onto the messy, clothes-piled floor only to go searching for them the next day? It happens to me a lot and I almost feel like surgically attaching a keyring to my hand. WHERE ARE MY KEYS!? It comes in six adorable colors — grey, orange, red, pink, black and green — and also serves as a safety whistle for when you’re walking down dark alleyways in the middle of the night. The best part is that the bird comes with a house, so when you come home you put birdie back into its cage and everyone is happy. The next day there won’t be any question as to where your keys are. Form vs. function? Why not have both? It’s a brilliant idea. I just wish I could’ve thought of it first! 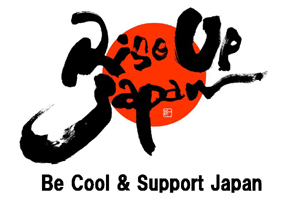 Japanizmo has a new online store called “RiseUp Japan,” where we’ll feature cool products created by amazing Japanese artists. Sale proceeds will be donated to Japanese charity organizations to help survivors of the Northern Japanese earthquake and tsunami. Our featured artist is Ichiro Kumiji, whose calligraphy has been seen on Namco Bandai video games, Hollywood event merchandise for Sho Kosugi, and gallery exhibits throughout Japan. Kumiji’s brush strokes are a thing of beauty. For anyone who has ever tried maneuvering a Japanese calligraphy brush, you’ll know it takes focus and a deft hand to pour raw feelings onto the paper. With a single stroke, Kumiji can convey both joy and heartache, sadness and love. Don’t Touch Me, I’m Electrified! It’s a neat tool that releases any excessive electricity in your body. What you do is press the end of it to whatever you’re about to touch. The LCD screen flashes a happy face when it’s done discharging. Luckily, this tool was invented. Maybe it can discharge the extra fat around my hips, too!